The public of Sri Lanka need not worry. Those who seem concerned that our foreign policy is like a rudderless boat with nobody at the tiller, better think afresh. It is in safe hands whatever the loquacious members of the opposition might say. Only the other day the Foreign Minister (the third under the yahapalana administration) told our legislators that he is armed with an ace. Never mind where he keeps it — whether up the sleeve or under the pillow — he will play it when the time is ripe. Let those-sovereign states, civil society groups, journalists and commentators who in the last decade or so have castigated Sri Lanka for the way it fought an enemy which in their expert knowledge could not be militarily defeated, take note. Our Foreign Minister is now armed and ready to press the button just like Kim Jong-un did last week sending his latest toy right into the Pacific Ocean to join the shoals of tuna which the Japanese turn into delicious sashimi. Foreign Minister Tilak Marapana said he knows when to play the ace. My fear is that somebody else is more likely to play the joker. It is not that some have not been playing the joker over and over again, turning Sri Lankan foreign policy into a tragic-comedy, defying sense and sensibility. So what is this ace that Marapana has armed himself with and thinks he can break the bank? Well, it is the information which Lord Naseby had been able to wrench out of the British Foreign and Commonwealth Office (FCO) from the war time confidential despatches sent by UK’s Defence Attache’ in Colombo to the FCO and the defence establishment. These vital despatches, despite being heavily redacted to save the British Government from diplomatic embarrassment, present a different picture of the last six months of the war against the LTTE, especially with regard to the number of civilian casualties, portrayed by Sri Lanka’s critics. The number of civilian casualties as assessed by Defence Attache’ Lt. Col Anton Gash based on figures he had been able to put together with the help of information obtained from knowledgeable sources on the ground, amounts to between 7,000 to 8,000. This is far, far less than the speculative 40,000 or more touted by some uninformed persons who served as ‘experts’ to then UN Secretary General Ban Ki-moon and other parties determined to inflate the number of casualties as props to their prejudices and one-sided narratives. What is so intriguing about this ace as Marapana calls it, is the summary treatment of it initially by the foreign ministry in a statement it made in or about October 25. On that occasion the ministry tried to dismiss-rather arrogantly too — the results of Lord Naseby’s three-year struggle to get at these despatches of the British Defence Attache’ in Colombo, particularly those sent to London during the closing stages of the war when the LTTE was using the Tamil civilians it had corralled, literally as cannon fodder. In fact, I had read the highly ‘censored’ despatches made available to Lord Naseby some weeks before he actually used them at the Lords debate on October 12 to buttress his case. His arguments clearly presented a counter narrative to that propagated by the UK and US governments, the main architects of UNHRC Resolution 30/1, which were highly critical of Sri Lanka and its security forces. They proposed measures inimical to Sri Lanka which the yahapalana government tamely accepted by co-sponsoring the resolution. Without being grateful for what the Lord had done to undermine the doctored case against Sri Lanka that western governments, the media and human rights activists had put together, the ministry in its peculiar statement seemed to go out of its way to belittle the result of the Naseby initiative. As I said in a previous column it is surely a rare foreign ministry that, responding to a media query on a serious matter that has not only engulfed Sri Lanka but has been, and still is, an unsettled issue for sections of the international community including the UN, would try to treat the deaths of civilians in war in such a cavalier manner. The Foreign Ministry treats the death of thousand of Sri Lankan civilians in a disastrous and debilitating war like a plaything and with no interest in trying to reach the truth. One thought that the then foreign minister by co-sponsoring Resolution 30/1 had agreed to establish a Truth Commission. Is not trying to arrive at the truth with regard to civilian casualties of war and how it happened, a crucial task of any commission established to search for the truth? Is it not of particular importance to the people of Sri Lanka bombarded with information (concocted or otherwise) by external sources that accuse its security forces of genocidal intent or deliberate killings, to know whether there is any truth in these accusations and whether the deaths were as high as 40,000 and even more according to some? Having pointed a finger at a “few individuals” who might feel good about what Lord Naseby was able to squeeze out of his own foreign office, surely it is a duty the Foreign Ministry owes the public to identify these “few individuals” who seem to have been elated by Lord Naseby’s disclosures which deflate some of the accusations against Sri Lanka’s security forces. The whole tenor and tone of the ministry statement is that those who are elated and even overjoyed by what Lord Naseby had unearthed with much diligence are somehow traitorous for supporting the Naseby initiative. After having put both of its feet in its open mouth, the foreign ministry tried to retract by pulling one foot out a couple of days later. But by that time the damage had been done because by then the media was digging into why the government was remaining silent over the Naseby disclosures. After all they provided vital evidence that ended the accusations levelled by our so-called ‘friends’ the UK and US which the UNP was vigorously cultivating. The “few individuals” that the Foreign Ministry alluded to had a few days later grown to include President Sirisena and State Minister of Foreign Affairs Vasantha Senanayake. Admittedly the government was late in recognising the value of what Lord Naseby had unearthed or there were attempts by some outside the ministry manoeuvring to downplay the Naseby findings. It must be said in favour of State Minister Vasantha Senanayake who was the first to take cognizance of the value of the Naseby findings which his own ministry possibly dictated to by an unseen hand was trying desperately to bury. He wrote an official letter thanking the British peer. On November 2 President Sirisena wrote to Lord Naseby thanking him for his help to Sri Lanka. Lord Naseby told me that the President’s November 2 letter reached him at the House of Lords delivered by our High Commission in London on November 21. Perhaps the Foreign Ministry and its satellite missions still rely on carrier pigeons for delivery. So now having done its best to denigrate Lord Naseby’s efforts on behalf of Sri Lanka which the British peer did out of his genuine interest in Sri Lanka, Foreign Minister Marapana who remained silent all those weeks until the foreign ministry vote came up in parliament, has also decided to cling on to the wagon. He has now realised he has an ace in his hand. He is only waiting for that singularly apposite moment to play it. Why? Because otherwise our critics would prepare a defence against it to destroy its impact. Minister Marapana does not realise that he is not at the bar table or even the card table. The last time he engaged in some advocacy in parliament speaking on the Avant Garde issue he had to throw in the towel and his portfolio. Surely he must realise that this ‘ace’ he is trying to keep up his sleeve is now rather passe’ in that it has been out in the open for six weeks or so. The arguments are well known here and Lord Naseby’s entire speech is available in toto in the British parliament’s Hansard. Lord Naseby has been interviewed by TV and he has said his piece. Doesn’t Marapana realise that the recent story published by Associated Press of some 50 Tamil asylum seekers who claimed to have been tortured by Sri Lankan security and played out in the media here and elsewhere was an attempt to divert attention from the Naseby story, was manipulated by the Tamil diaspora and some human rights activists? By the time our Foreign Ministry and some of its diplomutts scattered around wake up to meeting and countering such media manipulation the sun would begin to set in the east. This foreign ministry is more concerned with covering up its tracks and scratching each other’s back. Lord Naseby faced bureaucratic obstruction from the British Foreign Office when he invoked UK’s Freedom of Information Act to obtain the information he sought. Our own Right to Information Act which the Editors’ Guild fought for years to get on the statute book and Prime Minister Ranil Wickremesinghe advocated for nearly two decades, was made law by this yahapalana government. The government rightly claims the RTI Act as one of the most valuable pieces of legislation that it successfully piloted through parliament. But there are increasing signs that bureaucratic obstructionists are trying to undermine the public’s right to seek and receive information so that the dark dealings of ministry bureaucrats will not reach the public. As Lord Naseby once told me ahead of launching his quest for the Anton Gash despatches there will be bureaucrats standing in the way but one must be prepared to go up the totem pole to higher authorities and contest the decisions of officials and overcome their barriers. The same would have to be done to our own buroocrats who are trying to nullify the public’s right to know in the belief that they are the final arbiters of what the public needs to know. It would not surprise the public if they hear stories of officials whose backbone needs straightening playing around with technologically advanced mobile phones to hasten communications in the furtherance of favours. Large scale bribery and corruption are not the only obstacles that stand in the way of clean government. Officialdom has a hand in undermining the transparency, accountability and meritocracy that the government promised the people. 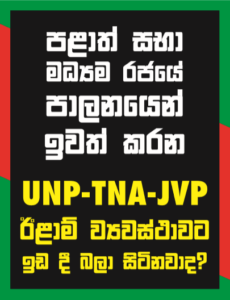 Now that the State Minister of Foreign Affairs Vasantha Senanayake has played a lead role in negating his ministry’s attempt to undercut the Naseby initiative, he should take a hand in cleaning up his ministry and ensure that laws are obeyed and adhered to.